The distance between wheels can be adjustable by it self. There are several specifications for customer choice; we also can special design according to customer’s requirements. 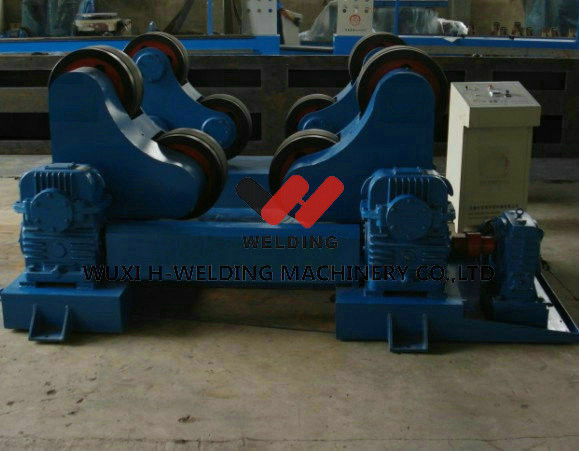 This series welding rotator has the types of self-aligned, conventional which are suitable for welding, polishing, assembly for pipe/tank/vessel longitudinal and transverse seam welding. Welding rotator can be auto adjusted according to the size and weight of cylinder, VFD rotary speed control, improving the reliability of operation. Our company also can customize welding rotator in all varieties according to client's requirements. It used in many industries such as pressure vessel, boiler, freezing equipment, power station construction, metallurgical, engineering machinery, marine building, and petro-chemical industries etc. 1. Main electric elements are Siemens/Schneider. 2. VFD rotary speed control, improving the reliability of operation. 3. Steel and rubber roller or PU roller which can ensure a long time using. 5. Accept testing before delivery. 6. Accepy special design and custom. Because we work closely with manufactures to understand their needs and provide the right machine solutions, accessories and consumables to support business growth. We are committed to providing each customer with the finest service and support available. Reliability and quick response all backed by our fully trained support staff and technical support center in H-WELDING. 10 years focus on this industry, That means we know what works and what does not when it comes to welding equipment. Our machines are built to stringent certification. There is NO OTHER welding equipment built to higher standards than the H-WELDING. Reputation is our life. Professional container package team, ensure a prefect machine can be send to your hand. A young but professional installation team, active all round the world with our machine, like a your friend always at his service. Feedback with your problem or pictures, within 24hour, your will get the answer.